This is a wrist watch that can also display the heart rate BPM (Beats Per Minute). 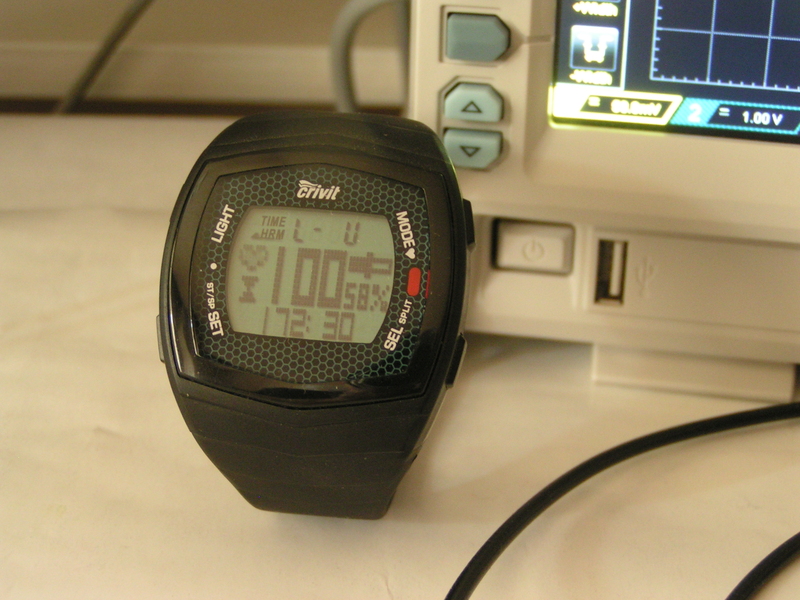 The heart beats are detected by a chest strap included with the watch. The chest strap have two conductive rubber pads that senses the electrical signals produced by the heart beats. No contact gel is required for the rubber pads. The link between the chest strap and the wrist watch is wireless, by an RF (Radio Frequency) signal. Being a very cheap item, it does not have any kind of connectivity, it can not log data, and it can not make charts. It would have been way more interesting to be able to see a ECG (ElectroCardioGram) or a BPM chart for the whole day. Could it be possible? 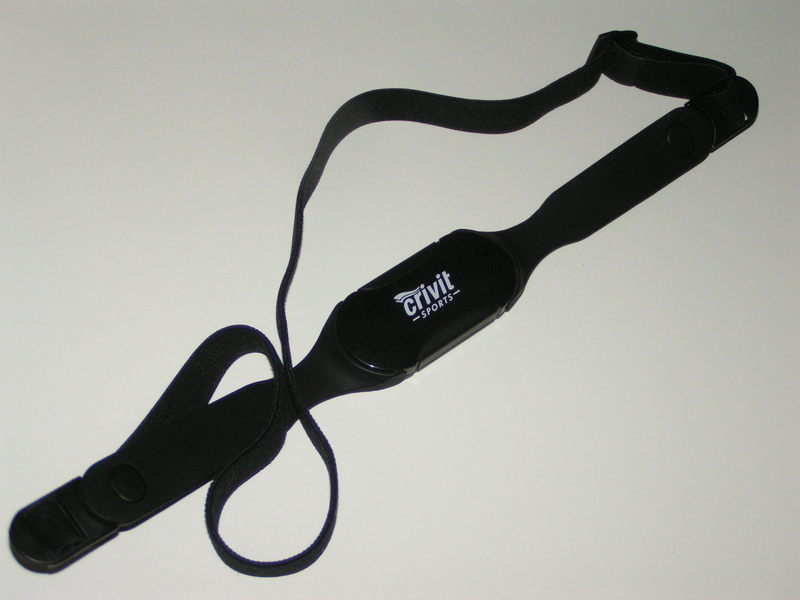 Couldn’t find any online technical documentation about this ‘Crivit Sports’ model. To receive the RF, a one loop coil was wrapped around the chest strap, by simply clipping the oscilloscope GND (GrouND) wire alligator to the tip of the probe, and around the chest strap transmitter. This is the signal received from the chest belt HRM for a constant heart rate of 100 BPM. 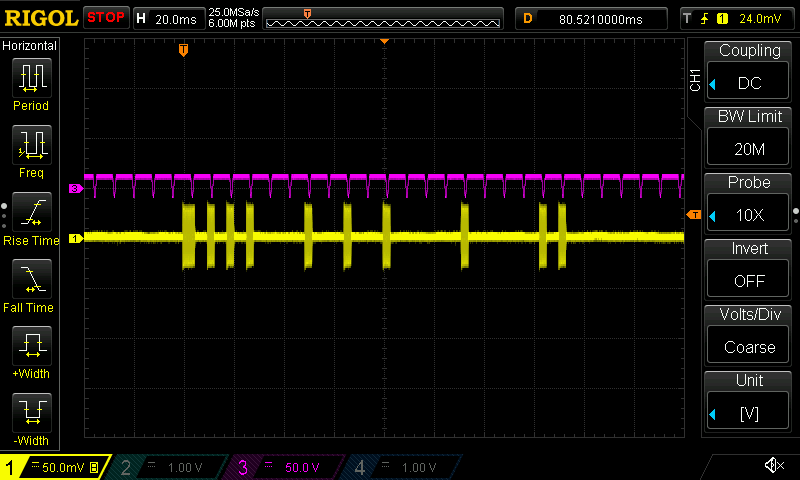 The RF carrier is at 110 kHz, 100% AM (Amplitude Modulated) by a digital signal. the remaining 13 bits encodes the BPM. This stream of data is received and decoded by the wrist watch, which then display one number, the BPM. Observed BPM displayed range was between 30 and 233. The watch displays the BPM no matter what ID the chest belt randomly picked. I tried to look at the carrier waveform corresponding to a couple of different BPM numbers, by doing push-ups in order to accelerate the heart beat. My intention was to understand the correspondence between the last 13 bits sent by the chest strap and the BPM number displayed by the wrist watch. Counting bits after making push-ups is not easy. I couldn’t figure out the encoding scheme. Another more rigorous testing way was necessary. Instead of using real heart signals, a signal generator (RIGOL DG4102) was used to simulate the electrical signals coming from the heart. By contrast with a real heart, the generator can produce any BPM number with high accuracy. 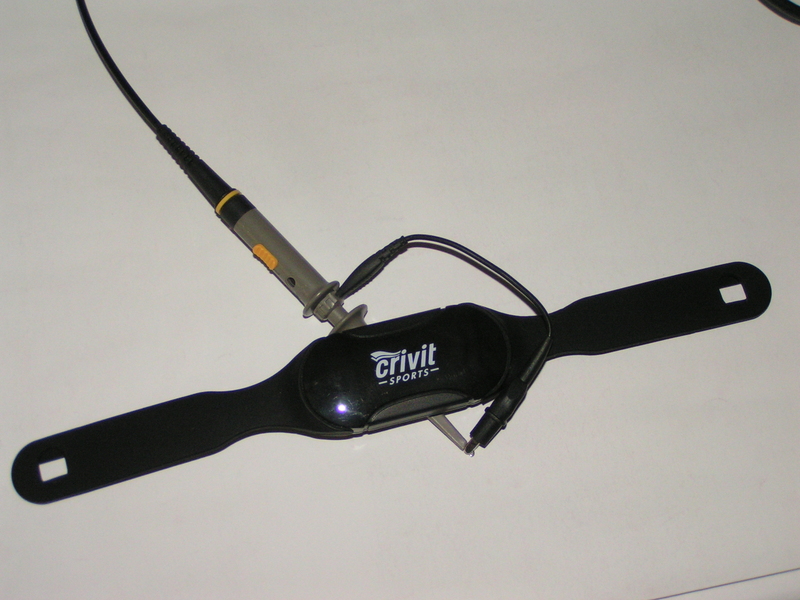 The output from the signal generator was connected to the two conductive rubber pads of the chest strap. 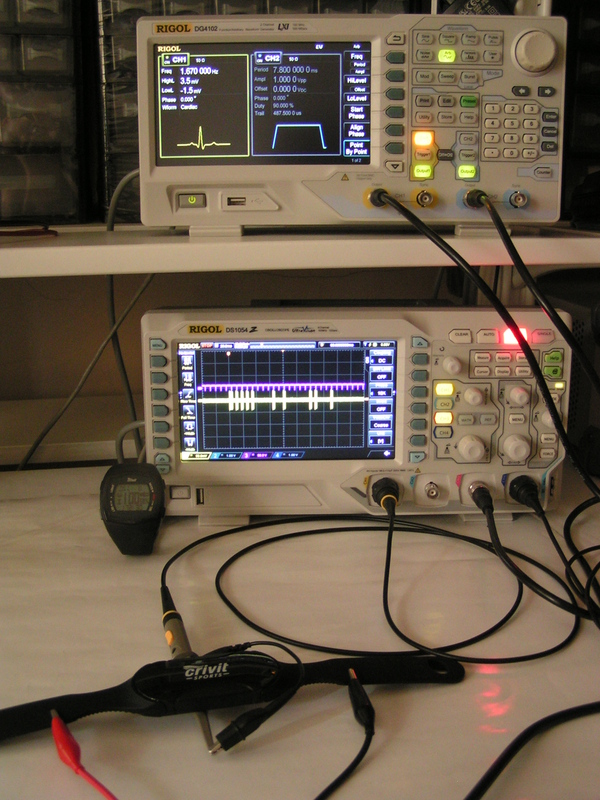 An one wire loop antenna was wrapped around the chest belt, and the received RF signal was displayed on the oscilloscope (RIGOL DS1054Z). Where ‘S’ is the Sync bit, ‘111001’ is the chest strap ID and ‘0101000100011’ is the BPM. For this particular signal, the wrist watch will display one hundred BPM. 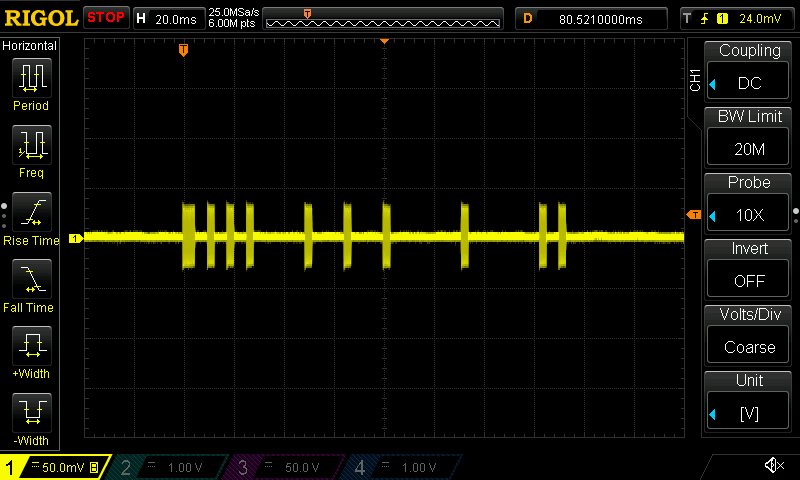 By varying the period of the fake heart beat generated signal, all possible heart rates were browsed. 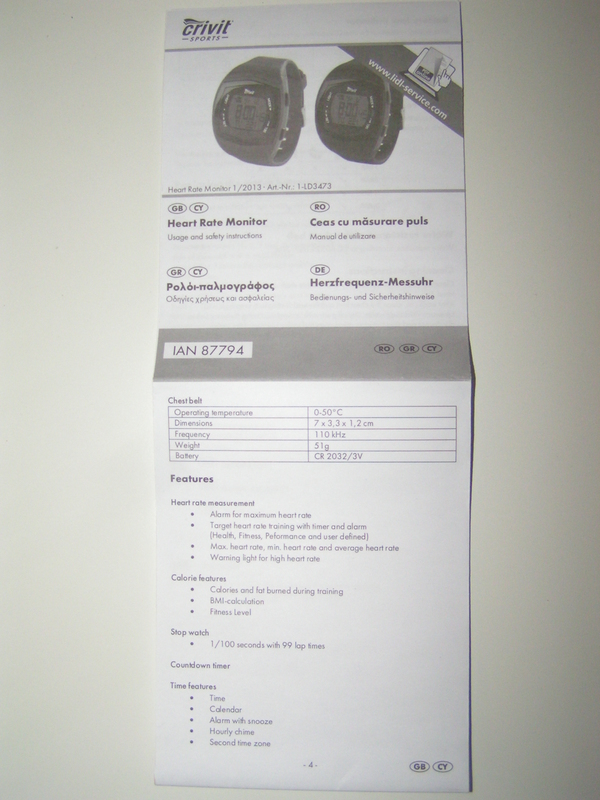 The following table contains the encoding bits sent by the chest strap for each possible BPM number displayed by the wrist watch. If someone recognizes this encoding scheme, then please let me know, because I still can not figure out the formula between the last 13 RF bits and the displayed BPM number.